Own your own building in Top Town and be apart of the Crestline Boom! 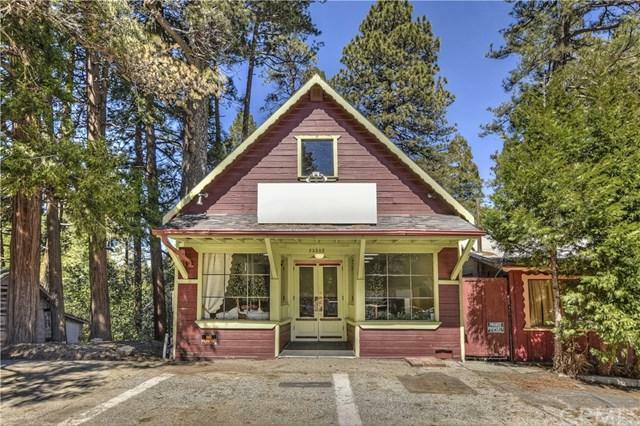 This 1940's building comes with the adjacent lot which has a 340+ sqft building on it and adds ample opportunity to grow and expand. Both lots total 7500 sqft & there's parking for 8 cars. The main floor building is approx 800+ sqft and even has the original wood floors & the bottom floor is approx 850 sqft. There is even an attic that runs the full length of the building. There are 2 large bathrooms and a spiral staircase that leads to the downstairs. Owner recently updated the heater, paint inside, 5/8 drywall, electrical and lighting & added a kitchenette, building has been well cared for through the years. If you have been wanting to own your own building and run your own business or maybe be a landlord, now is your chance. Skies the limit with this building(s). The basement is perfect for expansion, storage, possible sleeping quarters, or the use of your dreams. Don't miss this opportunity to be your own boss.